Hartal, or general strike, has long been a green light for some people to engage in street violence and kill people by setting vehicles including public transports on fire — regardless of whether there are passengers inside or not. No political parties in Bangladesh would take credit for the lives lost in the Hartals, which would make these incidents random acts of terrorism. However, if you take a closer look at when these terrorist acts take place, you will find out a pattern. A pattern that shows that these kinds of incidents occur on Hartals. And when a political party enforces Hartal knowing that this will provoke violence in the streets, nobody really needs to claim credit for anything anymore. Lately, probably because the term Hartal started to become a cliche, the politicians have changed the term from Hartal to Oborodh, which would be ‘Blockade’ in English. When it was announced, the people in my known circle acted confused. They didn’t know what ‘Blockade’ actually meant. Will the school-colleges remain open? Will it be safe to go to the office? Thanks to the continued violence through the days of so-called Blockade, we now know that it’s no difference. With the rising number of deaths due to political violence, ‘Blockade’ has just become yet another word that is synonymous to violence and killing. I wrote earlier that a kid’s life was lost as he was burned inside a covered van of his father. The car was set on fire with him inside, which isn’t a new thing by the way, and he didn’t stand a chance to live. He died on his first visit to Dhaka, leaving his father wondering why that happened to his son. Today, we have more news of such death. In Dhaka Medical College Hospital, there are people screaming of pain because their bus was set on fire during a 72-hour blockade last week. A couple of the unfortunate people have already died. 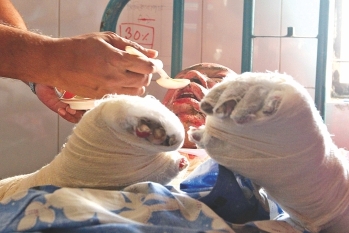 And there are more injured people facing a life-and-death situation in the burn unit of DMCH. Read the three links from the last two paragraphs and you’ll know there aren’t any difference between what Hartal used to provoke and what ‘Blockade’ has provoked in that 72-hour timeline in the past week. For the record, starting today, Saturday, November 30th, the same party have already enforced 72-hour blockade. A phase two of violence. People are already scared. The announcement of this phase two of 72-hour blockade was made within 12 hours from when it would take effect, putting many people on travelling in harm’s way. Nobody knows what will happen. It’s unsafe to even set foot in the streets. But people must go on with their lives. They must go to offices. They must go to earn their livelihood. They must take public transportation, buses, cars. And they don’t know what danger awaits in the streets of Dhaka. Those leaders of political parties will never know what it’s like to be outside in the streets. Hell, they don’t even know what it’s like to be in a traffic jam, because when they are out on the roads, police blocks traffic of their entire route half an hour before their car even gets out, a guard which I do not know if they deserve. How would they know what terror average people goes through when they have to step out of their home and be in the streets knowing that violence can erupt anytime, anywhere, leading them up to death. They don’t know. And so their so-called “Blockade” will continue. Lives will continue to be lost. After all, it’s the least valuable thing here in Bangladesh. Bangladesh definitely is a country where you wake up to read about innocent people’s death. It becomes so usual that one day, death of a person does not make you feel anything. It’s like you become emotionless by having read the news every day. You try not to go out as much as you can, and if you have to, you take your life in the hands and go out risking it. Those people in the streets have no value for your life. They might kill you. They might set fire on your workplace, the vehicle you are in, the surrounding garment factories and so many other assets of this country. No wonder Bangladesh’s development is a slow process. When leaders are meant to lead the country to a betterment, over here, they do the exact opposite. Political leaders call for these hartals and blockades knowing that lives will be lost, valuable assets will be lost causing the country’s economy and whatnot to take a path down. But what do they care? They need power. And we, the average unfortunate people of this little piece of land, accept the fate and move on with life.